He cuts down trees. Directly from the roots! Now the tree floating in the air. Hello, Mr. Tree! Let's me show you a little bit of physics. 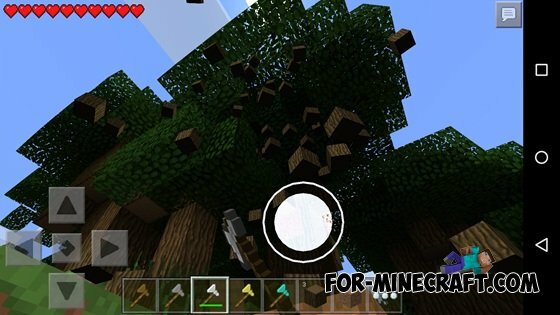 Introducing you to the cutting of trees mod TreeLogger PE! What is this sorcery! ??? How does this work? Please read! Mod calculates the time required to manually cut the wood block by block and the lower part of the tree becomes rigid. Try it! The leaves are also destroyed, as well as apples.